London Caribbean & Barbados interior designer Jenny Blanc. 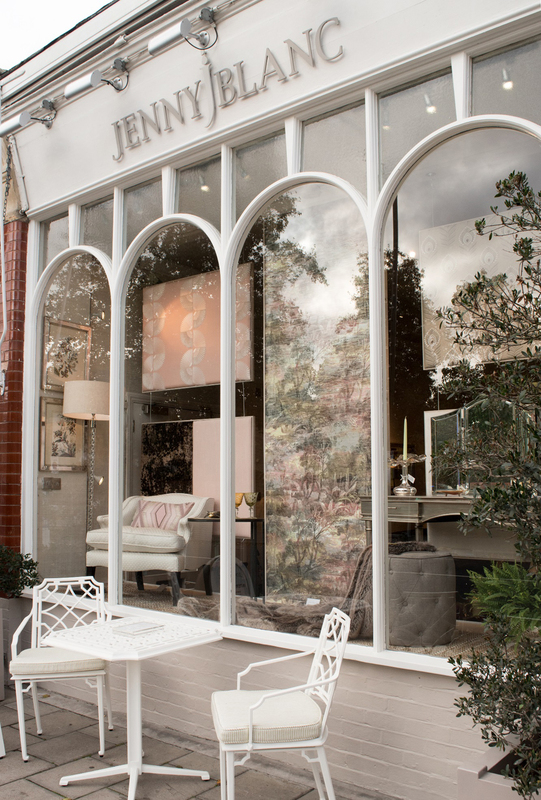 Jenny's love of interiors founded her design practice and west London lifestyle showroom fifteen years ago. The company's commissions involve British and International clients and have been recognised with four accolades from the International Property Awards, one four and two five star Best Interior Design Caribbean, and the coveted World's Best International Interior Design. This Valentine’s Day give a gift that is as unique as your love with 14 of our favourite gift ideas from our showrooms in West London and Barbados. ‘You Had Me At Woof’ doormat £25 / 2. Coloured Champagne Flutes £145 / 3. Diamante Photo Frame £19.95 / 4. Set of Two Champagne Flutes with Gold Stars £30 / 5. Set of Two Lavender Filled Fish £24.95 / 6. ‘Don Giovani’ Scented Candle, 7. ‘Swan Lake’ Scented Candle, 8. ‘Madame Butterfly’ Scented Candle all £55 each / 9. Heart Magnifying Glass £65 / 10. Hand Embroidered Velvet Hearts £35 each / 11. Pearl and Diamante Photo Frame £35 / 12. Travel Twin Photo Frame £35 / 13. ‘Love’ and ‘Perfect Match’ Match Boxes £10 each / 14. Man’s Best Friend Trinket Trays £19.95 each. Set the scene for romance with our collection of scented candles by Un Soir A L’Opera (‘An Evening at the Opera’). New to both our West London and Barbados showrooms, this new brand is the marriage of two worlds: that of opera, ballet and music with that of fragrances and perfume. Made in France by traditional candle makers, the Madam Butterfly candle captures Opera’s most enduring tale of love with notes of Sakura Cherry Tree and Verbena. The Swan Lake candle carries the fragrance of white flowers and fresh grass whilst the Don Giovani candle evokes the perfume of incense escaping from church doors. Atmospheric and intense, these candles are the ultimate gift for Valentine’s Day. Try pairing them with a box of ‘Love’ or ‘Perfect Match’ matches (13) to leave your Valentine in no doubt about your feelings! A set of two handmade, lavender filled fish (5) made from Liberty Print Cotton Lawn fabric and Dupion Silk will keep clothes and linen smelling sweet whilst our hand embroidered velvet hearts (10) make a charming addition to a wardrobe door handle or room key. A vintage style heart magnifying glass will make sure you spot Mr. or Mrs. Right on the horizon (and makes a lovely accessory for a dressing table or feminine writing desk in the meantime). 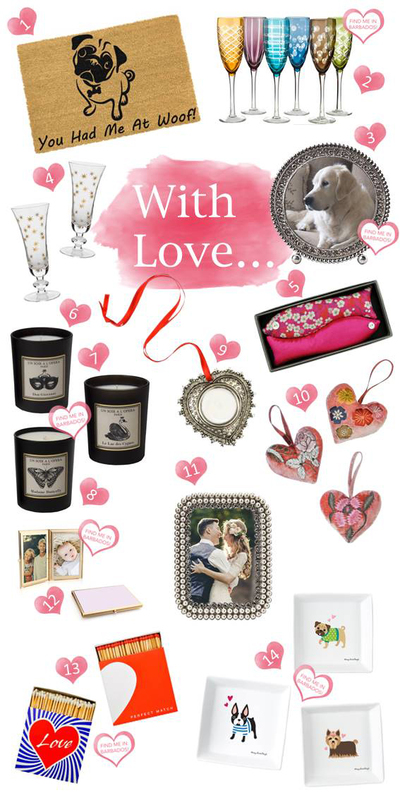 Keep your loved ones close to your heart wherever you go with a stylish, purse-sized travel frame (12) or make sure you’re never far from your loved ones thoughts this Valentine’s day by presenting them with your picture in a charming miniature diamante or pearl frame (3 and 11). For anyone whose soul mate is yet to walk into their life (or perhaps walks on four legs instead of two) our doggy door mats (1) and trinket trays (14) are perfect for self-gifting or for treating a friend who needs a pick-me-up! Shop in store at our West London or Barbados showrooms or online with Trouva. Orders can also be placed by phone – call 020 8943 4144 or contact us on connect@jennyblanc.com for more information. 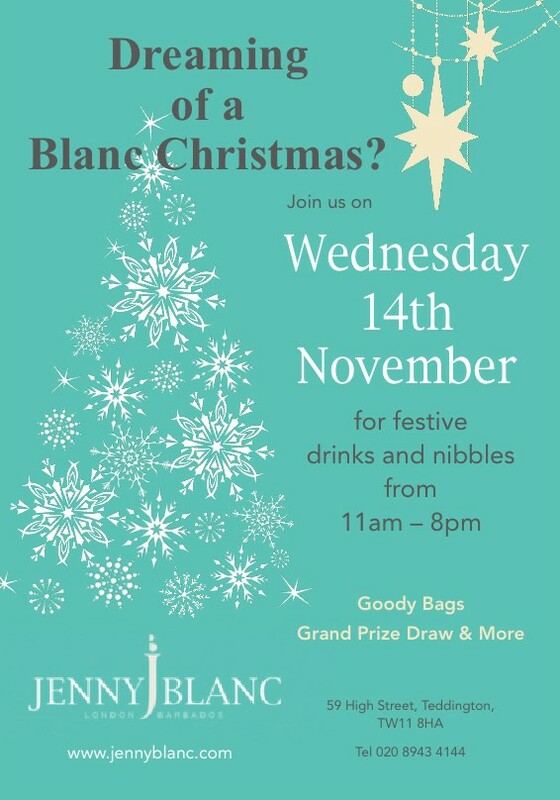 Are you dreaming of a Blanc Christmas? Join Jenny Blanc and the London team for festive drinks and nibbles on Wednesday 21st November from 11.00am – 8.00pm at our showroom at 59 High Street, Teddington. 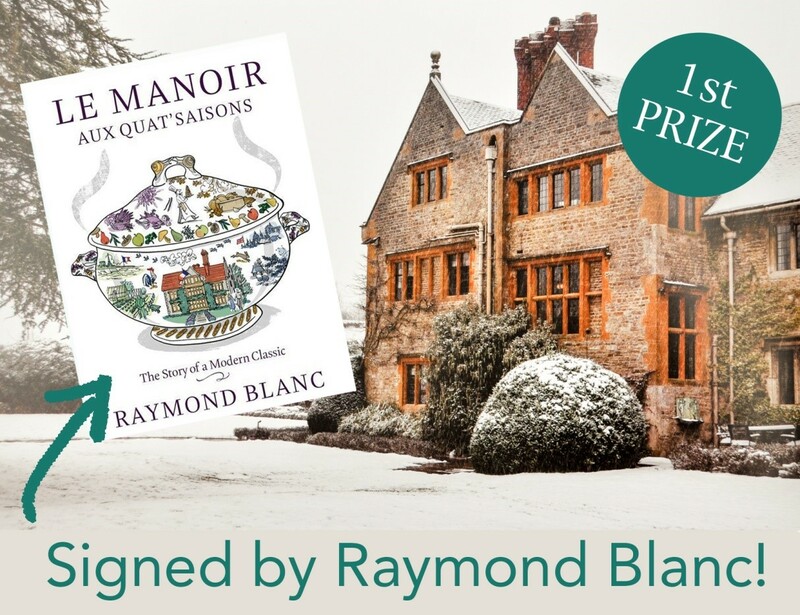 For our 1st Prize we are delighted to be giving away a signed copy of Le Manoir Aux Quat’ Saisons – The Story of a Modern Classic by Raymond Blanc. This book is a personal tour of the legendary restaurant-hotel through the four seasons, with 120 recipes from Raymond’s celebrated kitchens as well as a fascinating glimpse at how together, Jenny and Raymond discovered, bought and transformed Le Manoir into one of the country’s best-loved country house hotels. 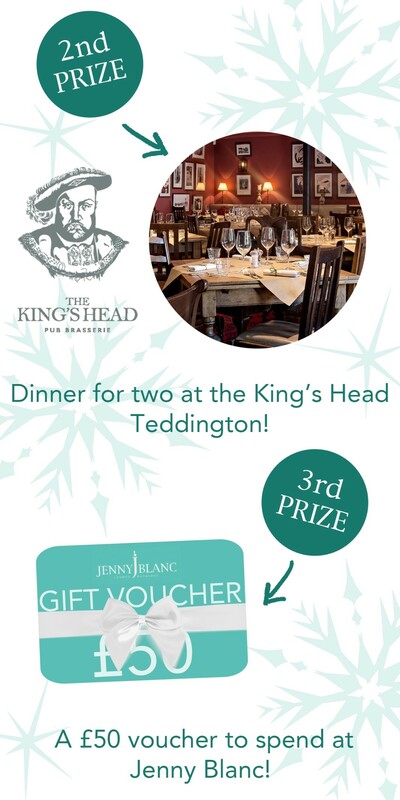 The lucky winners of our 2nd Prize will be able to enjoy a meal for two with wine at The King’s Head Pub Brasserie in Teddington. The 3rd Prize winner will receive a £50 voucher for Jenny Blanc Interiors – perfect for spending on Christmas treats for your loved ones (or yourself!). Don’t forget to take home a Jenny Blanc goody bag* including pampering treats by Neom Organics as a reminder to schedule in some ‘me time’ this festive season. Our showroom will be glittering with Christmas decorations and gorgeous gift ideas, ready to take home today and of course our team will be on hand to help you find that perfect present! For contact information and a map click to visit our website. *Free gift with purchase, while stocks last, arrive early to avoid disappointment! Call us on +44 (0)20 8943 4144 in the UK or +1 (246) 432 0989 in Barbados to place an order or selected items are available on our Jenny Blanc Boutique on Trouva. 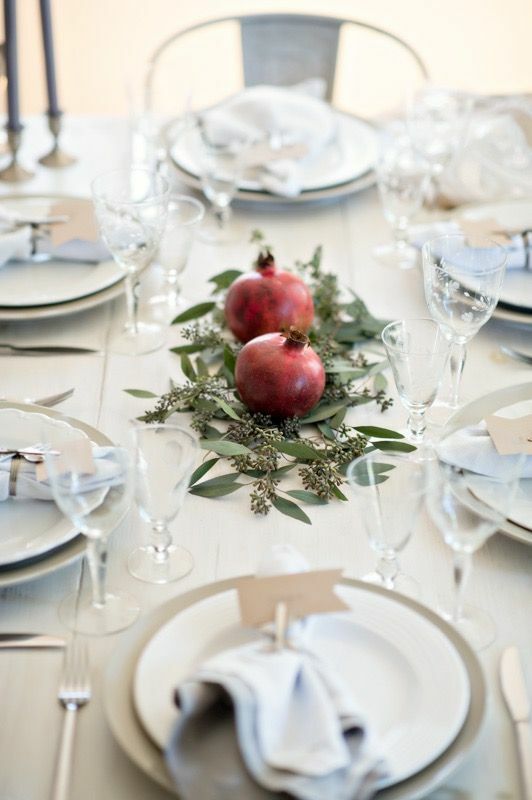 Above: Image from ‘How to set an intimate Rosh Hashanah table’ by Chai & Home. Rosh Hashanah is the Jewish New Year, a holy festival celebrating the creation of the world. In 2018 Rosh Hashanah will begin in the evening of Sunday 9th September and end in the evening of Tuesday 11th September. Traditionally the festival is celebrated with a special family meal where apple slices dipped in honey are served alongside plenty of sweet treats. The Michael Aram Pomegranate Collection takes its inspiration from one of the most universal and ancient symbols in the world, making it a beautiful addition to your table. The fruit of the Pomegranate has been prized across the globe, across cultures and across time as a representation of life, rebirth, and renewal as well as fertility and union. At Jenny Blanc Interiors we are proud to offer a special selection of products from the Michael Aram Pomegranate collection, perfect for gifting to loved ones at Rosh Hashanah or any time of year. These new additions to our London Showroom are available in-store or online via Trouva with worldwide shipping available. 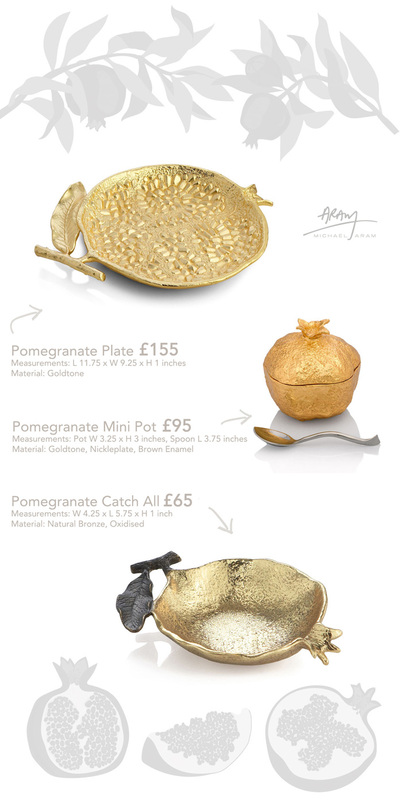 The Pomegranate Mini Pot with Spoon by Michael Aram (pictured below, centre) is a beautifully symbolic design which also serves a practical purpose – the gold-tone nickelplate lid lifts to reveal an enamel interior in a rich shade of brown which can be filled with honey, sugar or other condiments to enhance your table and create a memorable experience for your guests. 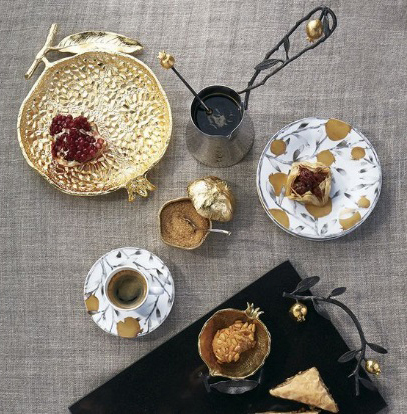 The Pomegranate Plate by Michael Aram (pictured above, top left) perfectly captures the shape and texture of the inside of a pomegranate and is the perfect accompaniment to the mini pot with spoon. 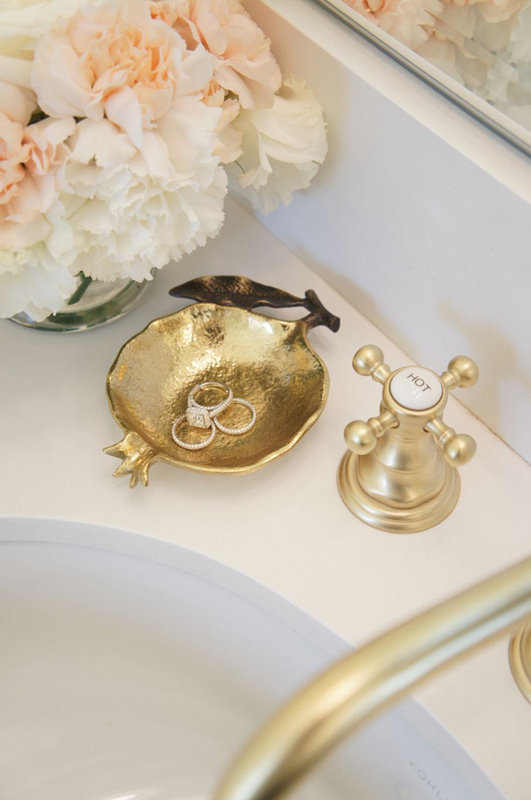 Handcrafted in goldtone, it makes an elegant addition to your table where it can be used to serve nibbles or as a decorative accent around the home. The Pomegranate Catch All (pictured below) is artfully handcrafted using natural bronze. The dish undergoes a series of grinding, buffing and polishing techniques meaning each creation is unique – a work of art in its own right. The design mirrors a sliced pomegranate complete with stem and leaf and is a beautiful addition to any bedroom or bathroom where it will keep rings and other trinkets safe. When you shop with Jenny Blanc Interiors why not make the gifting experience complete by taking advantage of our free gift-wrapping service, available both in-store and online via Trouva. Your gifts will arrive boxed and beautifully wrapped in our luxurious signature gift wrap. Call us on +44 (0)20 8943 4144 to place your order. Selected items are also available on our Jenny Blanc Boutique on Trouva. We’re very excited to announce that our special ’12 Days of Christmas Decorations’ Sale will be launching at our showroom on the West Coast of Barbados on Sunday 24th December! For 12 days only we will be offering fantastic discounts across our whole range of Christmas decorations including baubles and hanging ornaments, decorative object like our fabulous gold pineapples, tableware including luxury festive place cards, napkins and napkin rings. It’s the perfect opportunity to find that last minute finishing touch to complete your Christmas décor this year or get ahead of the game and stock up for next year. A beautiful ornament is also the perfect souvenir from a Christmas holiday spent in the sun! Here are some of our favourites – discover the full collection exclusively at our showroom in St. James. 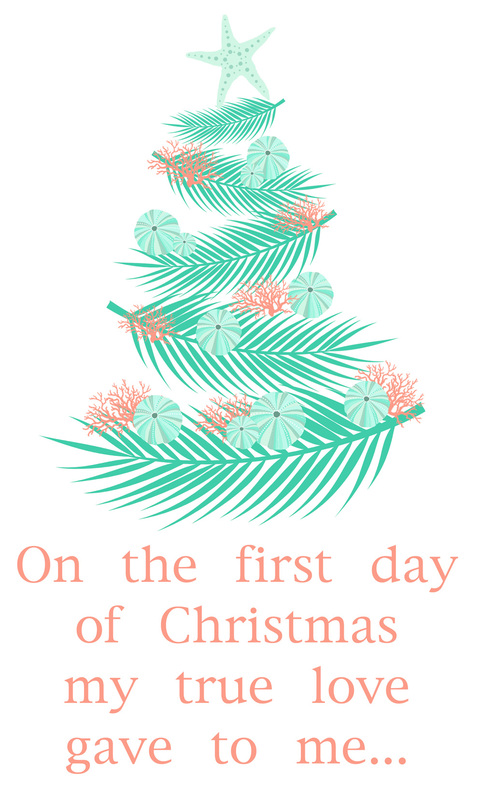 On the first day of Christmas my true love gave to me… A Peacock in a Palm Tree! 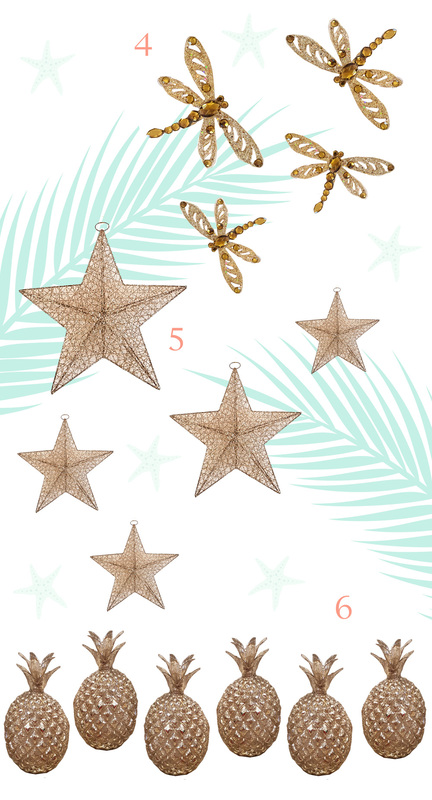 On the fifth day of Christmas my true love gave to me… Five Gold Stars! We look forward to seeing you at our showroom in St. James this holiday season. For directions and Holiday opening hours, or just to get in touch, visit our website here. 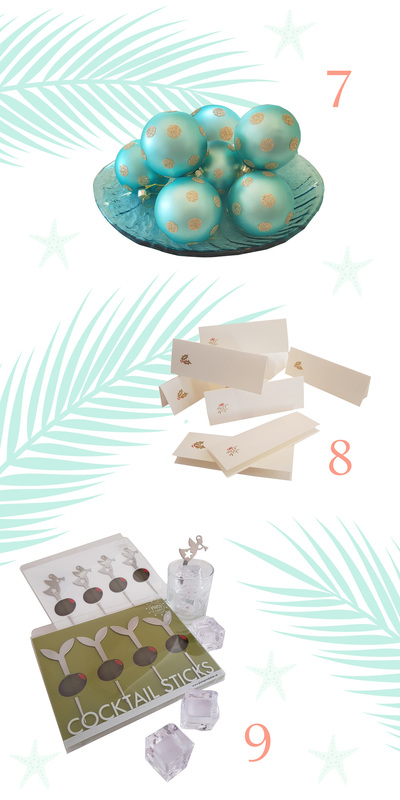 Fabulous gifts for everyone on your list and decorations to die for at Jenny Blanc! Still looking for that perfect gift? 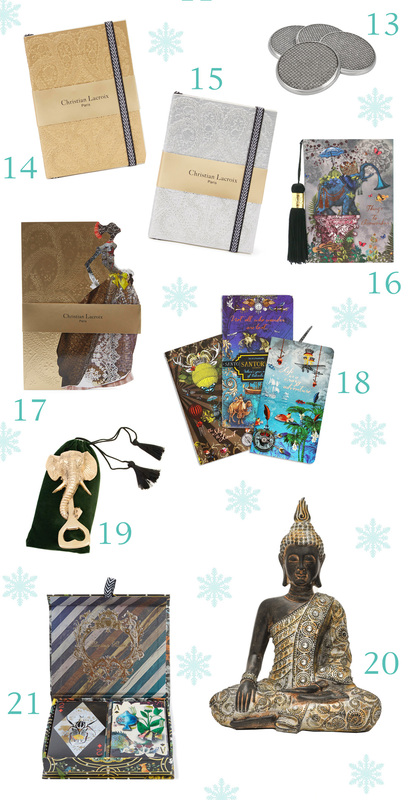 We have travelled far and wide to find something for everyone this Christmas. Discover these beautiful gifts and much more at our London showroom. 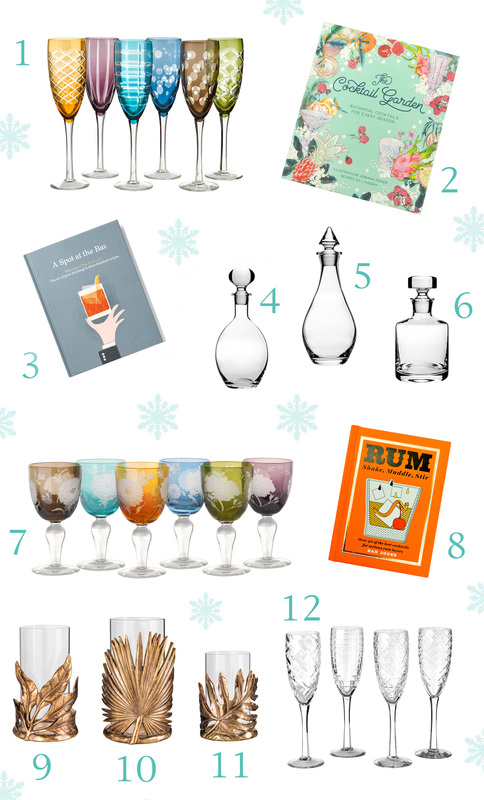 Many of these gift ideas are also available at our showroom in Barbados and online at our Trouva boutique! Our tropical leaf hurricane lanterns look stunning individually or as a group. A removable clear glass cylinder sits on top of an acrylic base finished in burnished gold – simply add a pillar candle to create evening ambience with a touch of tropical glamour! Also available at our Barbados showroom and online. ‘The Smell of Christmas’ by Aromatique is a captivating fragrance of citrus and spice made with a warm blend of natural botanicals which evokes the feeling of a traditional Christmas. The unique, decorative fragrance combines large dried botanicals and seed heads to create a beautiful display – simply arrange in a glass bowl to allow the fragrance to softly permeate your home. 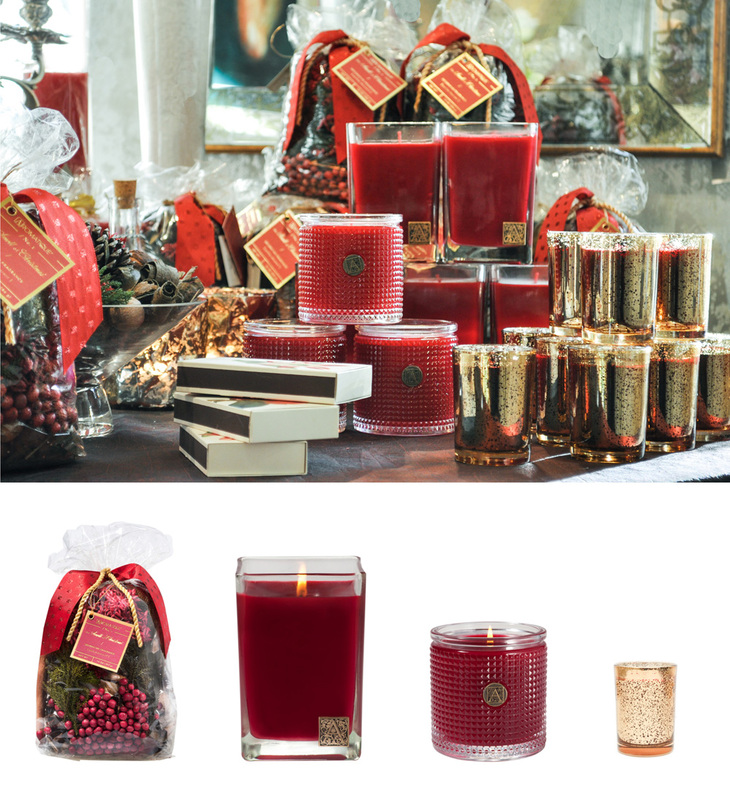 The candle collection is another way to further layer the scent and enjoy soft, ambient lighting as evening falls. We have candles in every size – from the cube candle which is ideal for larger rooms to the gilt votive which works beautifully as a bedside candle. From woodland creatures to sparkling apples and pears to sumptuous velvet baubles, we have a beautiful collection of decorations to transform your home this festive season. Spread the magic of Christmas throughout your home with our wonderful animal figures or trim the tree in style with a beautiful bauble or two – there’s something for every taste and budget at our London showroom. & 6. Clear acrylic stag statues on a plinth – the base conceals a colour changing LED bulb which illuminates the stag, perfect for adding a touch of Christmas magic to your home this season! (Stag 5: H 16 cm x DIA 6 cm, Stag 6: H 19 cm x DIA 6 cm) £19.95 each. For more information on any of these products contact our London showroom on +44 (0)20 8943 4440 or via our website. Call us on +44 (0)20 8943 4144 in the UK or +1 (246) 432 0989 in Barbados to place your order or selected items are available on our Jenny Blanc Boutique on Trouva. Today we are very excited to unveil the new window at our London showroom! This autumn we have chosen a beautiful collection of furniture with everything you need create the perfect bedroom sanctuary – a place to recharge and relax without the intrusions of everyday life as the nights draw in. 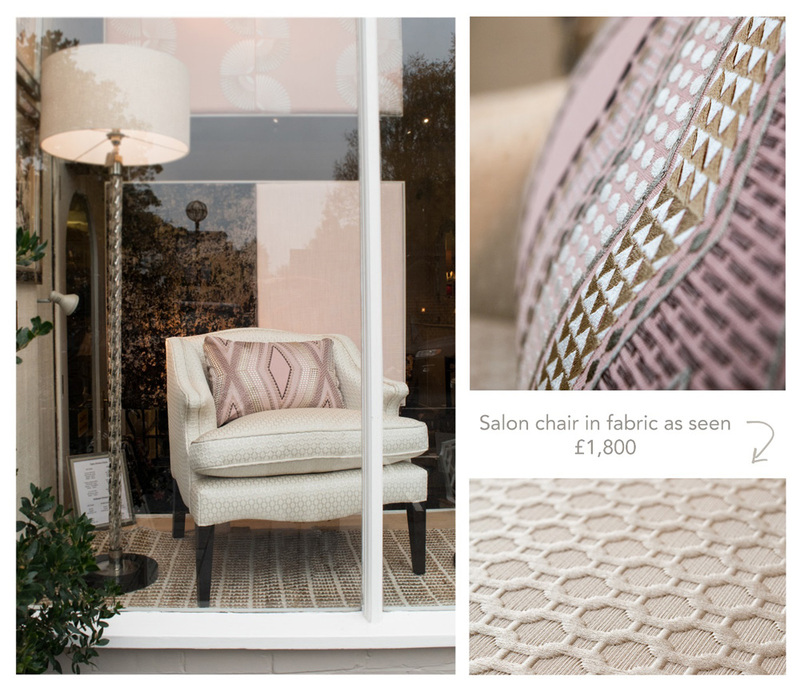 The stars of the show are a beautiful salon chair and silver dressing table, complimented by a contemporary wall covering and fabric schemes blending classic colours and on-trend textures to create two different but equally inspiring looks. 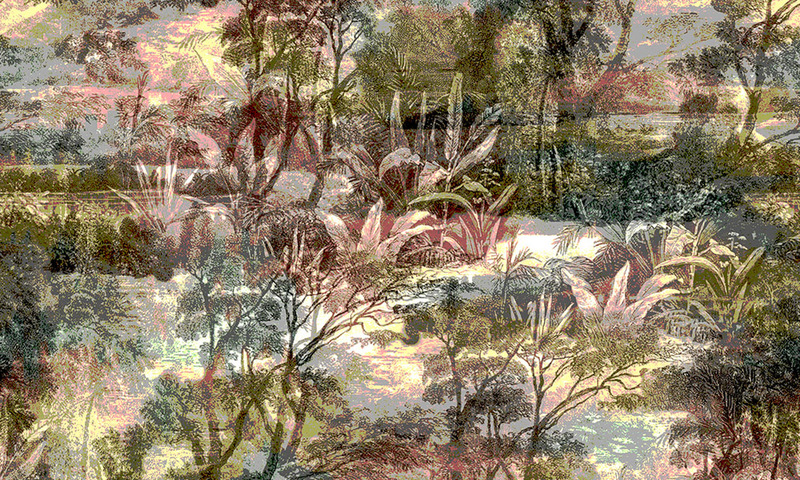 Current fabric trends for interiors lean towards texture including cut velvet, embroidery and other three dimensional surface decoration techniques. The salon chair in our autumn window is complemented by a gorgeous new fabric by Jane Churchill featuring a cut velvet fan motif on a cotton satin ground. 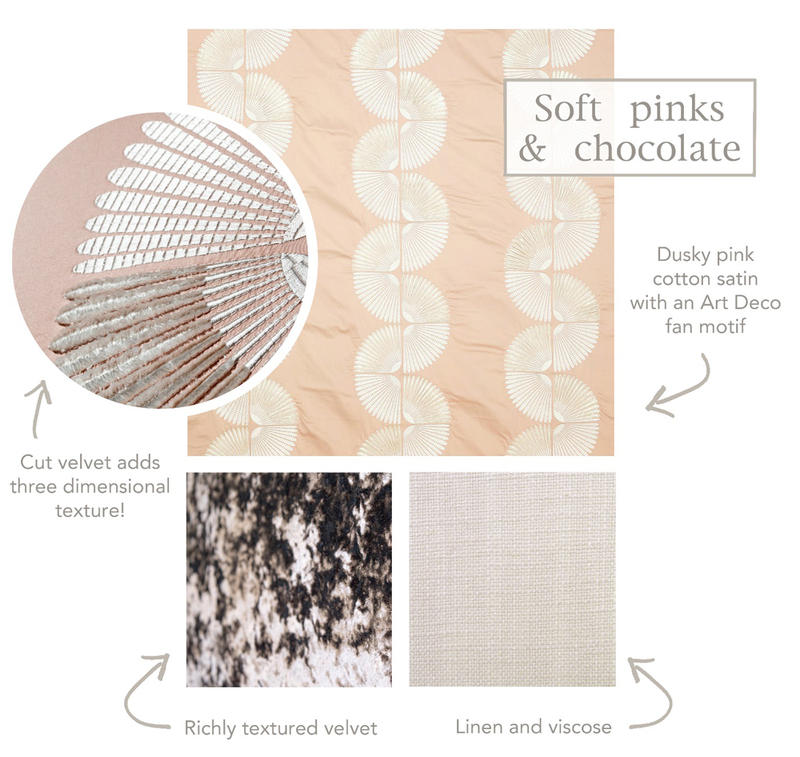 The dusky pink colour will add a feminine touch to any room without being cloying – especially when paired with rich chocolate brown. Textured velvet and a woven linen and viscose blend harmonise perfectly. An embroidered cushion with a geometric design pulls the look together and adds the finishing touch. In the centre of the window we have featured a contemporary wallpaper by Arte who are known for their ground-breaking, textured wall coverings. Bold wallpaper is nothing to be afraid of with a design this sophisticated – far from dominating a room, the subtle pattern and colouring will soften the space and add an element of glamour creating the perfect backdrop for your furniture and accessories. This is the perfect choice for a feature wall and is available to order by the roll. Our beautiful dressing table is complemented by a triptych mirror and elegant selection of accessories. 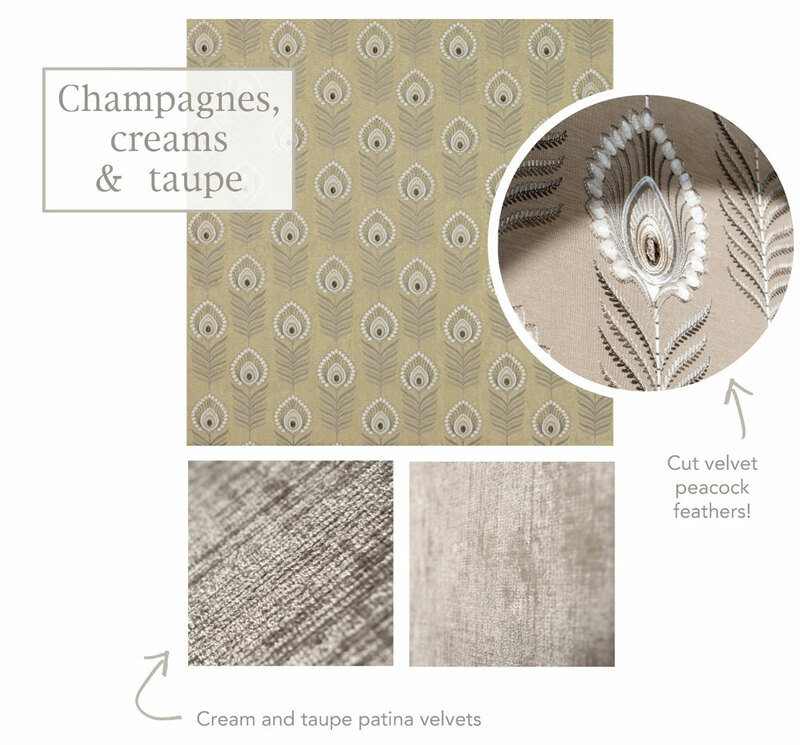 A sophisticated fabric scheme blending cool tones of champagne, cream and taupe completes the look. For the main fabric we have featured a new design by Jane Churchill which again incorporates cut velvet depicting a peacock feather on a gold ground. We balanced this eye-catching fabric with two chenille velvets which add texture and a touch of lustre. 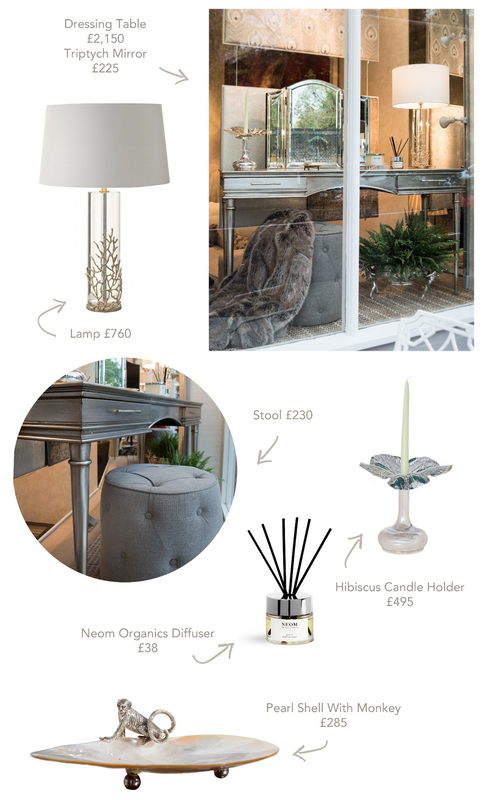 Accessories include a table lamp with a crystal base and gold coral alongside our signature shell dish with silver plated monkey and our show stopping silver hibiscus candle holder. A buttoned footstool like the one shown here is great for softening the overall look and is a practical choice when space is tight – simply slide it underneath the dressing table when not in use! We hope you like our autumn window – let us know what you think by leaving a comment or sending a message via our website. If you would like to order any of the fabric, wallpaper or accessories featured simply call us on +44 (0)20 8943 4144. Fabric is available to order from as little as one metre and can be shipped worldwide along with wallpaper which is available to order by the roll. If you can’t quite make up your mind, visit our showrooms and take advantage of our expertise – we’ll find the right fabric and wallpaper for you, creating a scheme you’ll love for years to come.